Thirty devotions, featuring today�s sports stars like Albert Pujols, Colt McCoy, and Tamika Catchings, that focus on a different kind of success�one that goes all the way to the soul. motivation for some of the world�s greatest athletes. Their main passion is not winning games but being their best for God. Through their experiences, fans and competitors can learn to focus on a success that goes beyond victory on the field or court. Be challenged by the example of Albert Pujols as he uses his sports platform to speak for those who can�t, who finds his way back to faith after a journey through addiction, and be encouraged by the perseverance that brought Tamika Catchings from shy girl to confident Olympian. With practical wisdom, meaningful quotes from the athletes, and wrap-up questions, these devotions lay out the game plan for being your best for God. 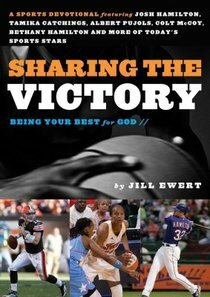 JILL EWERT has spent eight years communicating stories of faith from the world of professional and college sports as the editor of FCAs Sharing the Victory magazine. She also edits and frequently writes FCAs daily Impact Play e-mail devotions. She makes her home in Missouri.